GREENVILLE, S.C. — Thanks to a two-run eighth inning and five solid innings from their bullpen, the Power was able to overcome a pair of one-run deficits to take down the Drive, 6-5, Saturday evening at Fluor Field at The West End in Greenville. West Virginia and Greenville conclude their four-game series Sunday afternoon from Fluor Field at the West End in Greenville at 3:05 p.m. LHP Oliver Jaskie (first start) is on the bump for the Power, while righty Chris Machamer (first start) gets the call for the Drive. 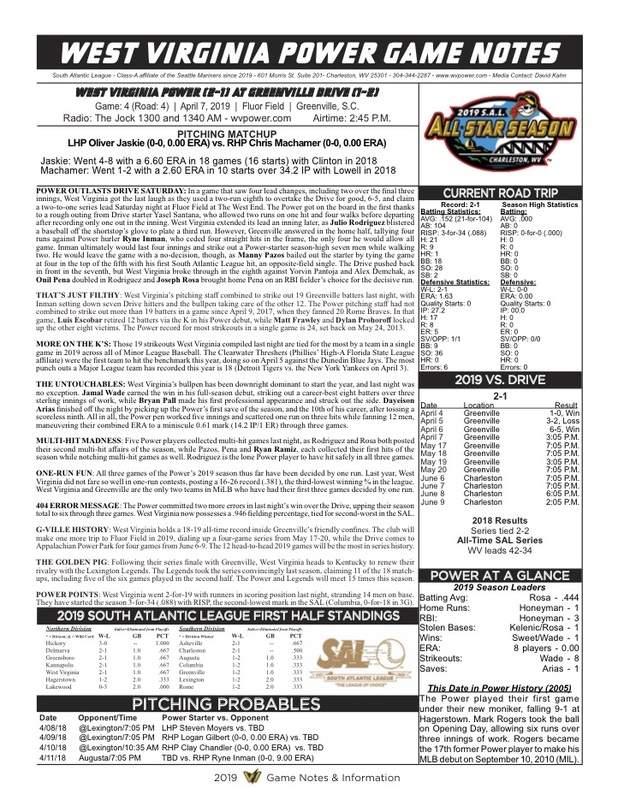 Pregame coverage begins at 2:45 p.m. on The Jock 1300 and 1340 AM, as well as online at wvpower.com and via the TuneIn Radio App and MiLB First Pitch App. 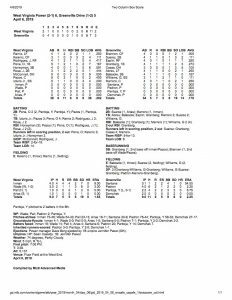 Saturday night, West Virginia (2-1) benefitted from a rough start by Greenville’s Yasel Santana, who lasted just one-third of an inning in his full-season debut. The Drive righty walked the first two batters he faced before giving up a scalded single to Julio Rodriguez that loaded the bases. The Dominican hurler fought back to strike out Onil Pena for the first out, but then proceeded to walk in a pair of runs by issuing free passes to Bobby Honeyman and Joseph Rosa, gifting the Power a two-run lead. Rodriguez extended West Virginia’s lead in the second against Angel Padron. After Cesar Izturis Jr. and Ryan Ramiz each singled with one out, Jarred Kelenic worked a walk to load the bases. Rodriguez then stroked one right at the shortstop, Grant Williams. Williams fumbled the ball into left field, allowing Izturis Jr. to score and push the Power’s lead to 3-0. However, Greenville (1-2) would rally back for four runs in the second against an otherwise-stellar Ryne Inman. After setting down Triston Casas for the first out, Inman surrendered four straight hits, culminating with a two-run double by Alan Marrero that put the Drive in front, 4-3. That was all the damage Inman would cede over four innings of work though, as he struck out a Power-starter season-high seven batters and walked just two. Manny Pazos would knot the score at four in the fifth on his first hit of the season, a smoked single to right, but Greenville would not settle, tallying a run of their own in the seventh to retake the lead against Jamal Wade (1-0), who was brilliant besides the two hits he gave up in that frame. The converted-outfielder tied his career-high with three innings pitched and struck out a career-best eight batters to pick up the win. West Virginia would put Wade in position for the victory in the top of the eighth, as Rodriguez worked a lead-off walk against Yorvin Pantoja (0-1). Pena then blasted his second consecutive double to left-center, scoring Rodriguez all the way from first to tie the game at five. Following a pitching change that brought Alex Demchak to the mound, Honeyman was able to reach base after Kervin Suarez mishandled a ground ball to him, shifting Pena to third. The next batter, Rosa, grounded into a fielder’s choice up the middle that scored Pena and gave the Power the lead for good. Bryan Pall tossed a scoreless eighth in his professional debut, striking out the side. Dayeison Arias (S, 1) finished it off in the ninth after working around a one-out double from Suarez, as he got Devlin Granberg looking to end the game. 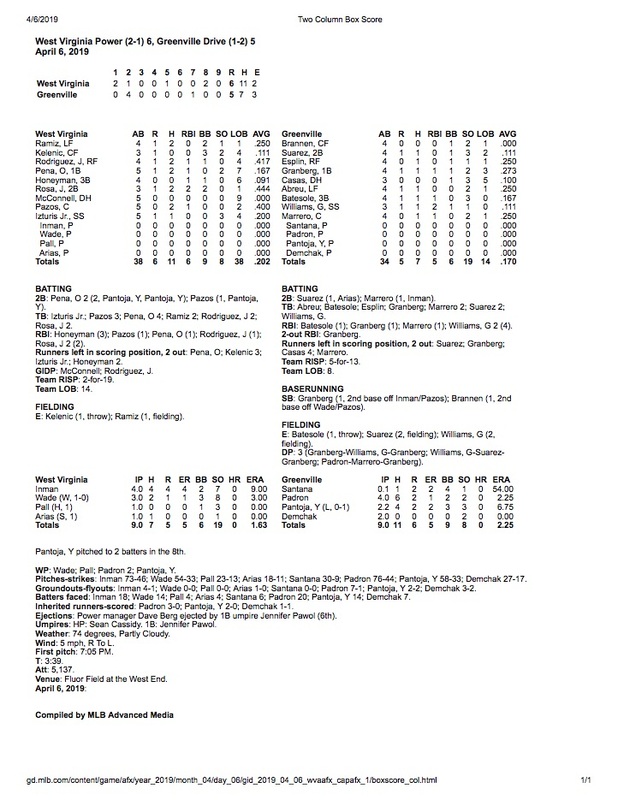 Five members of the Power lineup had multi-hit games in the victory (Pazos, Pena, Ramiz, Rodriguez and Rosa), while the Power’s pitching staff combined to strike out 19 batters, the most they have fanned in a single game since April 9, 2017, when they set down 20 Rome Braves over 11 innings. 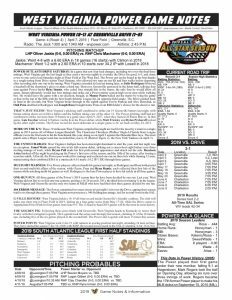 Following their seven-game road swing through South Carolina and Kentucky, West Virginia returns home to Appalachian Power Park for their home opener against the Augusta GreenJackets April 11. The Power’s opening homestand kicks off with a Rock 105 Thirsty Thursday, where fans of age can get $2.00 cans and 20-ounce draft beers, while college students can purchase two tickets for the price of one with a valid student ID at the box office. The first 1,000 fans will also receive a 2019 magnet schedule, while everyone can enjoy a fireworks show after the final out. For tickets and more information on the opening homestand, call us at 304-344-2287 or visit wvpower.com.